The results are in for the annual IT’S TIME TEXAS Community Challenge and in its first year ever competing, the City of Lancaster placed 2nd in the small city category! This included citywide effort and participation from residents, local businesses, faith based organizations, and the school district. Lancaster ISD finished first in the mid-size school district category competing against other mid-sized districts across Texas. The It’s Time Texas Community Challenge displayed the communities’ passion for living healthier and making healthy changes that will last forever. Lancaster’s focus with the Community Challenge is to increase the participation rate of the community yearly. The community knows that a healthy community is more prosperous, and by working together, hopes to make living healthy easier for all Lancaster residents. This state-wide challenge encourages communities of all sizes, including schools, businesses, organizations and mayors, to get excited about healthy living and ultimately transform the community’s health. More than one million Texans representing over 320 communities participated; 50 Texas mayors were engaged and more than 6,000 combined pounds were lost during the 2016 competition. 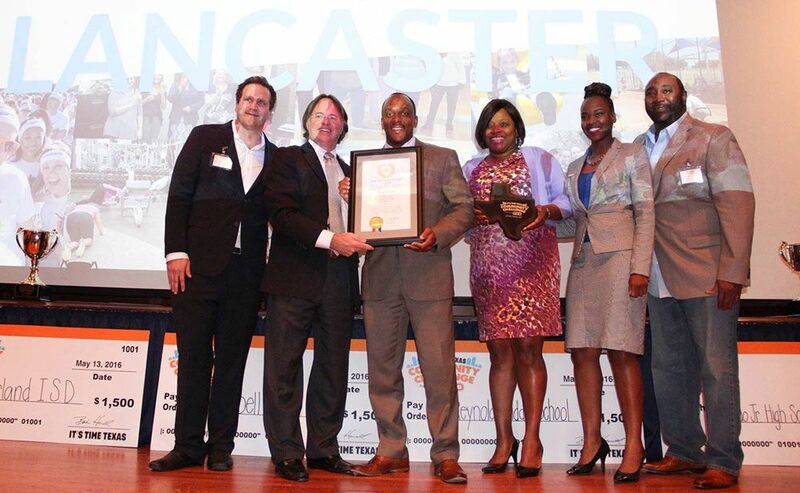 On May 13, 2016 Lancaster was recognized by It’s Time Texas Community Challenge at a state-wide awards ceremony in Austin, and Lancaster Mayor Marcus E. Knight and other Lancaster staff attended the award ceremony. “I’m truly impressed at how our community responded to the “It’s Time Texas Challenge” Mayor Knight stated. “Second place was a tremendous showing given our late start in the challenge. Congratulations to Lancaster ISD for achieving 1st Place in the mid-size district category. This victory was well deserved, and the school district’s participation aided our entire community to achieve second place in our respective category” he added.